You may enter your starting address in the form to the left. Then click "Get Directions." 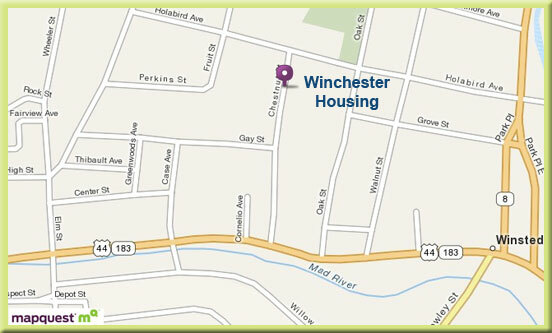 You will be taken to Map Quest to receive full turn-by-turn instructions to Winchester Housing at 80 Chestnut Street, Winsted, CT.
You may also use the instructions below; which will assist you if traveling North on Route 8. Turn right onto Chestnut Street. This is a one-way road. Our driveway is on the right, at the crest of the hill. You have gone too far if you reach the stop sign. Please use the lower level visitor parking lot (you will drive pass the main entrance to get there).